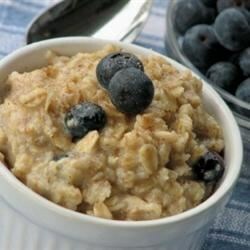 "This oatmeal is sooo yummy and hearty! Soy milk may be used in place of the milk." Bring the milk and water to a boil in a pot. Mix in the oats, and reduce heat to medium. Stir in blueberries, applesauce, wheat germ, cinnamon, and sugar. Cook 8 to 10 minutes, or until oats are tender. So yummy! I used a frozen berry mix(blueberries, blackberries, and raspberries) the first time I made this, the second I threw in strawberries and bananas. A little vanilla helps the flavor. I love this. Sometimes I add flax and I usually slice banana over the top after it's in the bowl to add more texture, nutrition, and flavor. This was a great change from the usual oatmeal. I used strawberries instead of blueberries. This would be great with any fruit and a very healthy way to start the day. Thanks Cassandra. Good oatmeal, not great but I'm really trying to make healthier breakfasts on the weekends. I did, however, have to add more sugar (and a touch of salt).